The Centennial Gala raised $1.2 million for the newly created Next Century Leaders Scholarship Fund -- the largest initial donation to an endowed scholarship fund in the University’s history. 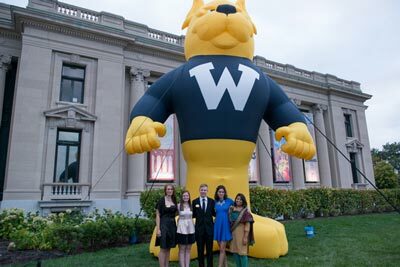 ST. LOUIS – Webster University’s yearlong Centennial celebration has come to a close. The institution’s historic milestone, which kicked off with a street party in downtown St. Louis in September 2014, was capped with a public Dance Through the Decades full-day event on Nov. 13 and a private gala celebration of historic proportions at St. Louis Union Station on Nov. 14. 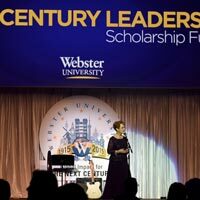 At the gala Webster alumnus Jenifer Lewis, a stage and film actress and one of the stars of the hit television show “Blackish,” led the entertainment while Marilyn Fox, philanthropist and Webster University Board of Trustee (BOT) member, chaired the gala. For those events and the many in between, friends and supporters of the University came together from the St. Louis region and around the world to celebrate a year of engaging with this storied institution. proclamation from the City of St. Louis and letter from President Obama. Webster University used the occasion of its Centennial to raise its level of awareness in a number of ways. 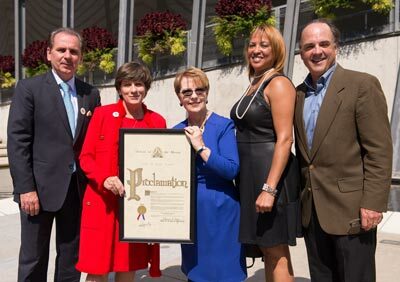 Significantly, the City of Webster Groves, Missouri, the City of St. Louis, Missouri, and the City of Columbia, South Carolina, all issued official proclamations to recognize Webster. Additionally, the 113th Congress passed Senate Resolution 465 commemorating the Centennial of Webster University. The White House also issued a special letter signed by President Barack Obama recognizing Webster’s 100-year impact as a global institution with commitment to the military. 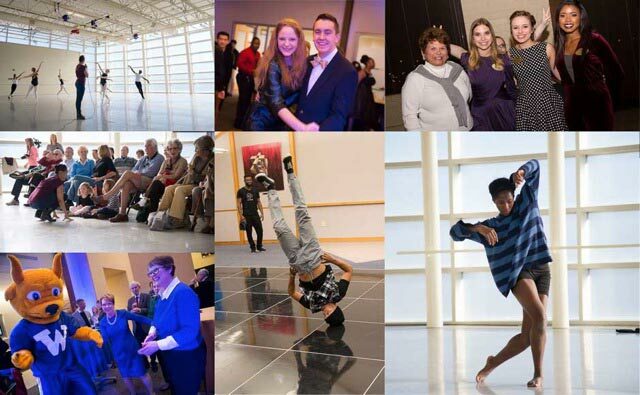 "Dance Through the Decades," an all-day celebration free and open to the public, engaged the community and celebrated 100 years through the many languages of dance with cultural and historical exhibitions, demonstrations, speakers, presentations, films, performances and a student formal. 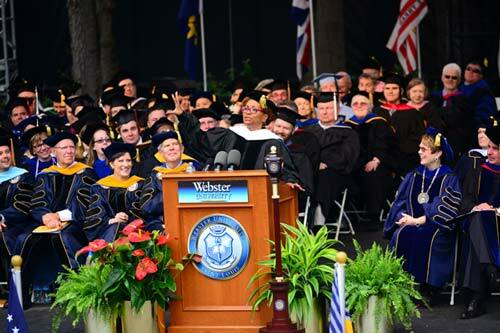 “As we celebrated our Centennial, we helped to build the foundation for Webster’s second century with Webster’s new strategic plan, Global Impact for the Next Century,” said Elizabeth (Beth) J. Stroble, president of the University. “The strategic plan advances what Webster has accomplished in its first century, as celebrated during the past Centennial year." Webster accomplishments through the University’s Centennial year fall into the four broad categories of the strategic plan. Missouri History Museum in Forest Park, part of a record Homecoming. The Centennial planning process itself was inclusive – with representation from all university constituencies including students, alumni, faculty, staff, retirees, donors, BOT members, friends, founders (Sisters of Loretto), partners and community members. All campus locations were represented in the planning. Remaining true to Webster’s global/local commitment, all Webster locations around the globe participated in the Centennial year in a way that was most relevant for their location. Global celebrations such as the 2014 Toys for Tots Campaign brought all campuses together in a common cause – partnering with the Military to provide toys for a worthy cause. Alumni participation in Centennial Homecoming events was at an all-time high and the Garden Glow Centennial homecoming event will now be an annual favorite. Retirees returned to campus for the first time establishing what will become an annual retiree event to inspire those who commit their lives in service to Webster to continue to engage with the institution. by alumnus Patrick Murphy, premiered in the Loretto-Hilton Center. The University published a coffee-table book, “Webster University: A Century of Defining Moments.” The book is filled with historic photos, personal stories and descriptions of significant events throughout Webster’s history. In addition, the Nine Network of Public Media produced a 30-minute documentary about Webster University – “Webster University: 100 Years” – and aired it twice this semester in the St. Louis viewing area. 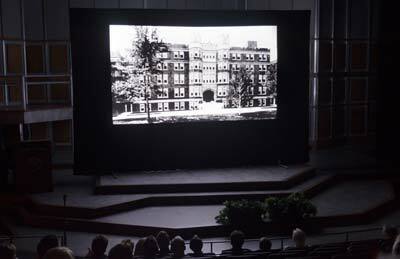 The film traces the University's community impact through the decades leading up to the centennial, and highlights the vision for its second century. It includes archival footage and interviews with Webster leaders, Sisters of Loretto, historians and community members who witnessed Webster's transformation. The documentary is viewable online at http://video.ninenet.org/video/2365572158/. The Global Student Leadership Summit brought 20 undergrad and graduate students from around Webster to gather for case studies, leadership exercises and student-led proposals to strengthen Webster and build their own leadership skills and cultural awareness. As a March 2015 signature event of the Centennial celebration, 30 student leaders from throughout the worldwide Webster network gathered on the home campus in St. Louis to discuss leadership and advocacy. They were participants in the University’s first Global Student Leadership Summit, which will now become a recurring event every two years. The students were able to present their input, feedback and ideas into the University’s strategic plan, Global Impact for the Next Century. Another student-favored event developed by the Centennial Students sub-committee was the burying of a time capsule to be opened in 2040. This inspired worldwide participation and all locations were represented in the time capsule, marking Webster’s global benchmark in 2015 for our future colleagues. As part of the Centennial, the University held a contest in early 2015 to create a new alma mater that represents the University’s mission in its second century. The last alma mater was selected via student contest in 1945. Department of Music chair Jeffrey Carter led this spring’s contest, open to submissions from Webster faculty, staff, students and alumni. "Webster U. You Are Our Home," by Christopher Poetz (Class of 2016), was selected based upon the overall appropriateness of the lyrics and music, with particular attention to how the lyrics reflect Webster’s mission, vision and values. 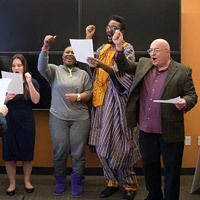 The song debuted in the Thompson Music Building in April and had its first fully public performance at the 96th Commencement ceremonies in May. This University asset is now available to all campus locations to use during special events. Alumna Jenifer Lewis '79 wowed the crowd at the 96th Commencement. A similar contest was held for the University's first-ever fight song to be used for Athletics. Alumnus Michael Hillstrom ‘94 was selected as the winner for his composition, "Go, Go, Gorloks!" During the Centennial year, Webster was recognized by the C200, an organization of the most senior women executives in successful private and public companies from around the world who manage more than $300 billion in annual revenues and assets. 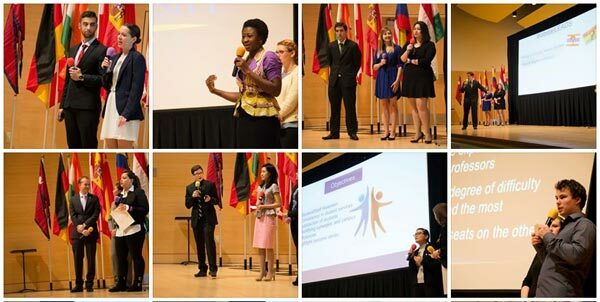 The organization brought a daylong conference, C200 Success Shared Conference, Journey to a Global Future, to Webster. During the conference, three Webster MBA students were each awarded a $10,000 scholar award by the Committee. Two other students were named as runners-up to the scholar awards – gaining access to the influential C200 organization. Students selected for the honor were from Webster Groves, Geneva, Florida and studying online – a good representation of Webster’s diversity. All Saints Chapel (now Winifred Moore Auditorium) in 1915. 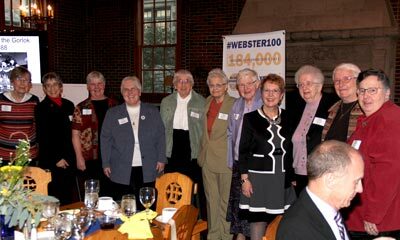 Also during the Centennial year, Webster University established a new scholarship to honor the Sisters of Loretto, the founders of the University, and to strengthen scholarship between Webster University and high schools established by the Sisters. Three students will be awarded the $5,000 scholarship. The award is renewable for a total of four years. To be eligible for the award, the graduating seniors must have graduated from one of the following high schools: Nerinx Hall High School in Webster Groves, Missouri; Loretto Academy in El Paso, Texas; or St. Mary’s Academy in Denver, Colorado. We look forward to welcoming the first Webster University Loretto Community Scholars in fall 2016. College of Arts & Sciences Professor Warren Rosenblum. The Webster Groves faculty presented nine Talks of the Century – brief, engaging and intellectual conversations including "Transformative Learning" by Roy Tamashiro, professor in the School of Education; "Celebrating Stories of Finding Voice: Making the Case for the Epistemic Value of Forensics and Debate" by Scott Jensen, professor in the School of Communications; and "Collages of Central and Eastern European Cities’" by Brad Loudenback, professor in the Leigh Gerdine College of Fine Arts. 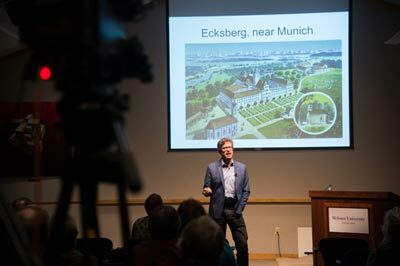 Webster Geneva inaugurated its Centennial Speaker Series with a theme that examines a critical issue from the last 100 years of human history and involves collaboration among multiple Webster academic departments. “Open Wounds: A Century of Crimes against Humanity" brings together the International Relations, Media Communications and Psychology departments who are invited to reflect and present on this common theme. Meanwhile, Webster Ghana held its final celebration of the Webster Centennial on Nov. 14, by bringing together 105 young African leaders, Webster students, faculty and staff through the Young African Leadership Initiative (YALI), a U.S. President Barack Obama initiative encouraging the next generation of African Leaders. Webster’s commitment to student success and long-term sustainability were front-and-center during the Centennial year. Endowed scholarships were created through the “Centennial Scholarship matching fund,” raising more than $2.5 million for students. In addition, the Next Century Leaders Endowed Scholarship raised an additional $1.2 million through the Centennial Gala. The $1.2 million donation was the largest initial donation to an endowed scholarship fund in Webster University’s history. biology student Joshua Embry, donor Jinny Browning and Provost Schuster. 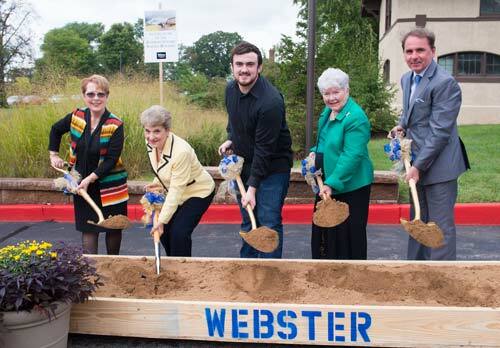 In September, the University broke ground for a new Interdisciplinary Science building, a project that had been in discussion for more than three decades at Webster University. The Centennial provided the impetus to move the project forward with generous support of donors. The ISB will triple the number of science labs on campus, support greater academic collaboration, and position the University to meet the region’s employment needs for decades to come. The building will significantly advance the work in STEAMM (Science, Technology, Engineering, Math and Medicine) across the Webster network and signals Webster’s commitment to academic excellence in its second century. 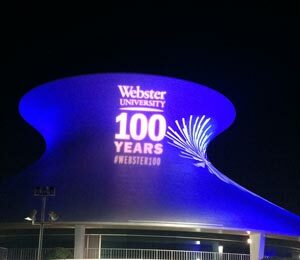 Webster University lit up the city for the Centennial kickoff. See more #webster100 photos from the city gobo poject. Webster100 around the city: See more photos from the Centennial kickoff's #webster100 gobo project, where Webster "shined the light" on area landmarks to acknowledge how the community has helped Webster thrive in its first 100 years. More than 233 media stories mentioning Webster’s Centennial were exposed to an audience of 213 million in the USA, Leiden, Vienna, Geneva, Thailand, Ghana, France, UK and India. An additional one million people were engaged through social media including Facebook, Twitter, Google+ and Instagram. Of note, on the historic day, Nov. 1, 2015, exactly 100 years after the Sisters of Loretto laid the first cornerstone of Webster Hall, Webster University was recognized in The New York Times for its global access to higher education. See a stream of all Centennial news from the year. Visit the Centennial site for an archive of images, videos and content that tell the Centennial story. See how it all wrapped up with faculty, staff, students, Board of Trustee members, alumni, retirees and community leaders at the Centennial Gala, which raised $1.2 million for student scholarships.